Massaging the kale is the secret to unlocking its full yumminess. In 2013, I went to Seattle for three nights and had occasion to eat a Kale caesar salad not once or twice, but three times. And every time it was fantastic beyond my wildest expectations. How, I wondered, could they make Kale, the Castor Oil of salad greens, so delicious that I wanted to eat it every night? I kept crawling the Internets but could never find anything. Then I found two different recipes, one from Emmy Cooks (which was adapted from the Skillet in Seattle, where I first had the salad) and Serious Eats. Emmy Cooks is nearly perfect except it left out parmesan; Serious Eats called for anchovies. Both of them call for croutons, which I skip because I am in constant war against carbs, but between them I figured out one great recipe. Though it is common to cut the kale into ribbons, I don’t do that since I buy the ‘washed and cut’ bag from Whole Foods which I don’t feel the need to cut. The secret is to massage the kale with olive oil and add a sprinkle of salt about 30 minutes to an hour before serving. This makes a HUGE difference in the texture of the kale, which most people remember as plant-like with an unforgiving chew. Once you’ve broken it down via olive oil massage, it is pleasantly crunch like the crisp end of a romaine, which is why it makes such a perfect Caesar. I originally used the Cuisinart for this dressing, but soon discovered that because only the garlic needed “smashing” that crushing it with a press meant I could hand whisk the dressing, which makes it faster and easier to clean up. You may find you need to adjust any of the given ingredients, particularly the lemon and parmesan, depending on consistency preferences. Very often I will try to use less mayonnaise, as it is the least heart-healthy ingredient of the bunch. I also find that if you oil up your kale, you can go without too much dressing. 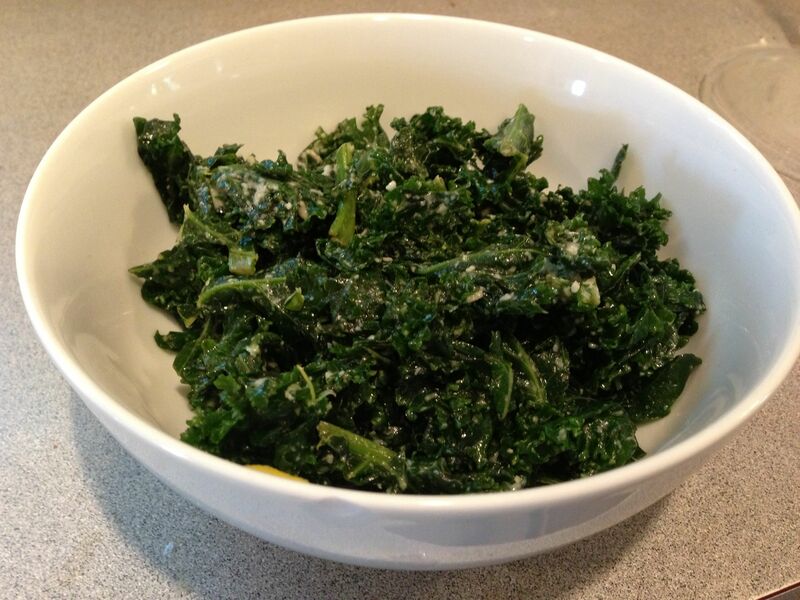 Lastly, a few times I’ve had the oiled-up kale in bowl, people have come by, grabbed a piece and said ‘delicious,’ indicating that the dressing may be unnecessary? Certainly from a caloric load it is. I will never ever go back to romaine. Unless, that is, it’s grilled. Thought it’s pretty obvious, you can see my recipe for Grilled Romaine Lettuce here. Posted in Sides & Salads and tagged Kale, kale caesar, Robert deutsch recipes, Seattle, seattle kale on May 12, 2014 by Robert Deutsch.